What if, the first war never happened? What if everything had went along just fine? No Dark Lord....No killing...None of that? Instead there was a simple war, a small attempt on London that had failed to succeed. Here at Charms and Hexes that is what we focus on. A normal Hogwarts role play that takes place during the years 2011. No canons, no dramatic plots. Just your imagination and original and fresh characters. Teenagers can live normal lives here without worrying about being blown to pieces. The fighting is because of Quiditch, not death eaters and the students and staff alike all have their own problems and quirks to deal with. 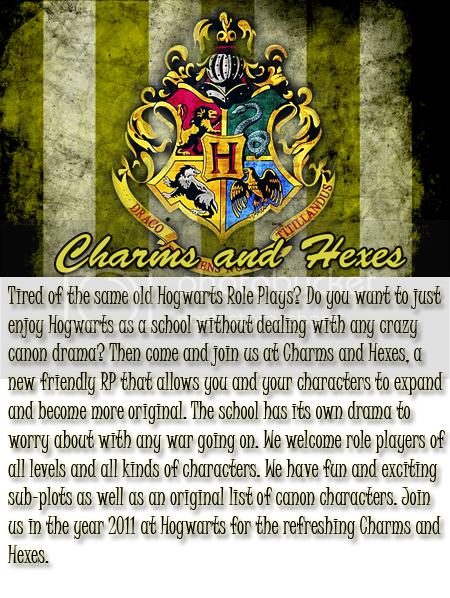 So have fun and role play for fun, at Charms and Hexes! We curretly have two sub-plots running so there is a low level plot for those of you who like to have one! If you would like to join, please do so. Thanks!